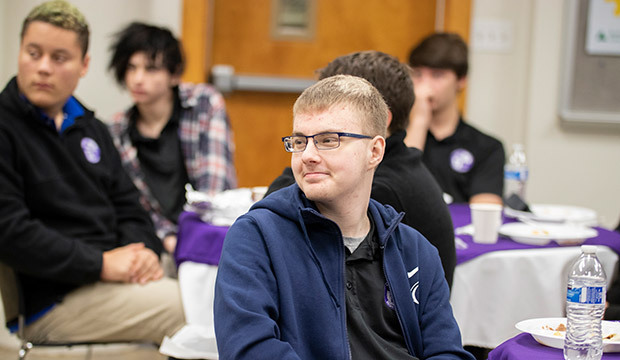 FORT WORTH — Seminarian Sam Maul said that he could pinpoint the exact moment he began thinking seriously about becoming a priest, and he was the same age as many of his listeners at Cassata Catholic High School in Fort Worth. 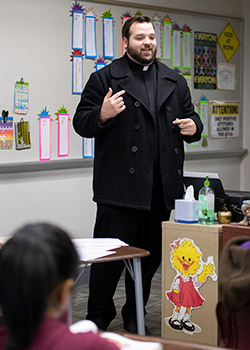 Maul was one of five seminarians who, along with Father Maurice Moon, visited Cassata Jan. 14 as part of “Vocation Day.” Seminarians visited every high school in the Diocese of Fort Worth in January and are slated to go to elementary and middle schools in May. 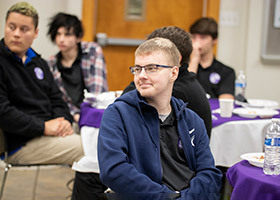 At Cassata, several members of the group spoke to high school boys at a breakfast and then talked briefly to students in their classrooms. Maul was a 15-year-old attending a camp at University of Notre Dame in Indiana when he had a life-changing encounter. Although he attended Mass regularly with his family, he didn’t know any priests. Campers were invited to have pizza with seminarians and priests on campus. “One of the priests looked at me and said, ‘Have you ever thought about being a priest? Well, you should,’” Maul said. Those words caused him to think differently about his life. Ordained seven months ago and now chaplain at Nolan Catholic High School in Fort Worth, Fr. Moon didn’t consider the priesthood at all when he was in high school. Interested in partying and friends, he quit going to Mass and dropped out of high school. He thought making money and having a girlfriend would make him happy, but “something was missing.” That missing piece prompted him to start praying, reading the Bible, and learning about the Catholic faith. Fr. Moon’s renewed interest in faith led him to go to Confession for the first time in 15 years. When the priest absolved him of his sins, he felt a peace he’d never known. Another seminarian, Joseph Moreno, told students that he didn’t receive his call until after his wife of 20 years passed away. She had brought him back to church and helped him grow in his faith. “Despite the differences between the men who spoke, I do believe this is what they want to do in life,” Chavez said. Freshman Joseph Hernandez, 15, also said the message was inspirational. Joseph has a brother at Nolan Catholic and had met Fr. Moon before. Joseph was interested to hear that some of them didn’t decide to become priests until later in life. Students asked questions such as how long it takes to become a priest (nine years for most of them) and what their course load is like (they study a lot of philosophy at first, and then theology, and they have a year of pastoral service). The visiting seminarians are all engaged in their pastoral year and are serving at various churches in the diocese. Cassata Principal Maggie Harrison said that many of the students in the school, which is an outreach to the community and involves a self-paced curriculum, are not Catholic or have not been involved in the faith. They learn that priests are real people and are very approachable. The school draws students who have not been successful in a traditional high school or want to accelerate their learning. Some students are grieving the loss of a family member or may experience depression or anxiety, Harrison said. About 80 students benefit from the school’s individualized instruction and encouraging atmosphere. The visitors told students that the point of Vocation Day was to urge students to reflect on their futures.